If you are an iPhone user and heavily rely on the phone then you must have experienced sudden data loss. For example, you deleted something important on your iPhone, lost or broken your iPhone, or failed your iOS upgrade or sync, etc. Whatever the case may be, you can recover data by extracting iTunes backup if you’ve synced your iPhone with iTunes before. Why Need an iPhone Backup Extractor Tool? As we know, iTunes syncs with iPhone when plugged into computer and easily backups all iPhone data like photos, videos, contacts, SMS messages, and etc. What you should note is, the backup file are not allowed to access or preview, you can’t directly take any data out of iTunes backup. If you have such a need, iPhone Backup Extractor Free will do you a favor. 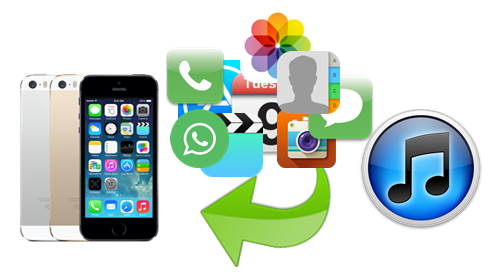 – Extract and recover any file from iPhone backup, like contacts, messages, photos, videos, notes, WhatsApp, etc. – Works well with all iPhone models, including iPhone 6S, 6S Plus, 6, 6 Plus, 5S, 5, 4S, 4, 3GS, as well as iPad Pro, iPad mini 4/3, iPad Air 2, and iPod touch. – Enable preview of scanned photos, videos, contacts, messages, notes, and other data before extraction. – The application has very simple and intuitive interface. No technical knowledge is required. – Read-only software, which performs data extraction without interference on any original data. – Completely free for personal and non-commercial use, no spyware, malware, or adware. Step 1: Run this free iPhone Backup Extractor and select the backup file you need extract data from. Step 2: Specify the files types like photos, videos, contacts, messages you need to extract from iPhone backup. 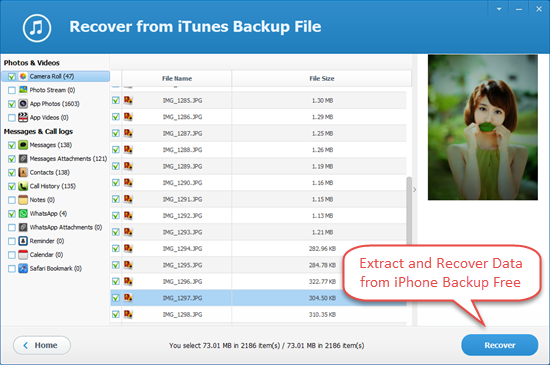 Step 3: Preview and check the scanned files, then click “Recover” to extract files from iPhone backup. 1.Don’t sync your iPhone with iTunes after you lost data on it. Or the iTunes backup file will be updated and overwritten by the content on your iPhone, and the lost data will go forever. 2.If you don’t have any available iTunes backup, don’t get disappointed, get an iPhone Data Recovery tool. Connect your iPhone to computer via USB cable and let the program scan the phone directly and recover lost data.